Our new rims on the Mercedes-Fans magazine! The text is in German, but below you will find a translation in English. 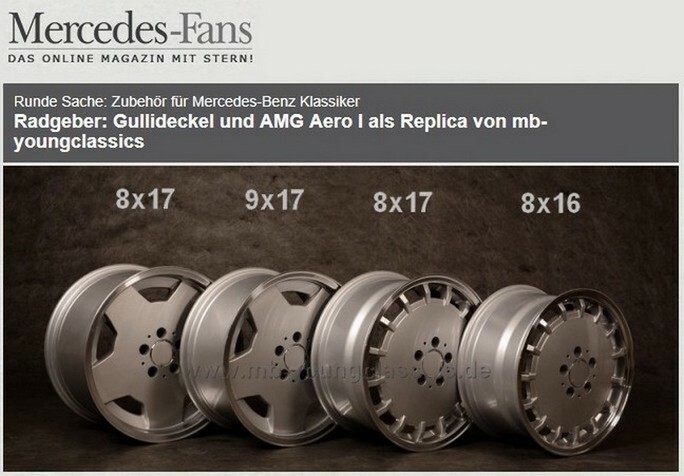 For more than three years mb-youngclassics has been selling replicas of Mercedes-Benz rims in addition to original 70s to 90s rims restored to customer specifications. Certain classic rims have become rarities. Due to their rarity the prices are high. The AMG Aero I 8×17, for example, is one such coveted wheel. mb-youngclassics can now offer this wheel as a replica at a lower price than restored originals. At mb-youngclassics the manhole covers are now installed on vehicles of the W124, W126, R129 and R107 series. There have been no problems with the registration so far. Roland Müller: “There should be no problems with the registration of vehicles with historic number plates. For all vehicles of the “manhole cover era” this appearance and also rims of the dimensions 16 and 17 inches existed. The production date 2018 must also not be an obstacle for a TÜV inspector, because otherwise he would have to refuse the H even with a new tail light, fender or oil filter. Finally, an aluminium rim is also a spare part which has to be replaced with an equivalent new component. Our customers receive all necessary documents for the registration after the purchase by email. If, contrary to expectations, there is a problem with the registration on site, we will be happy to help you – in an emergency, we also offer registration at our company! 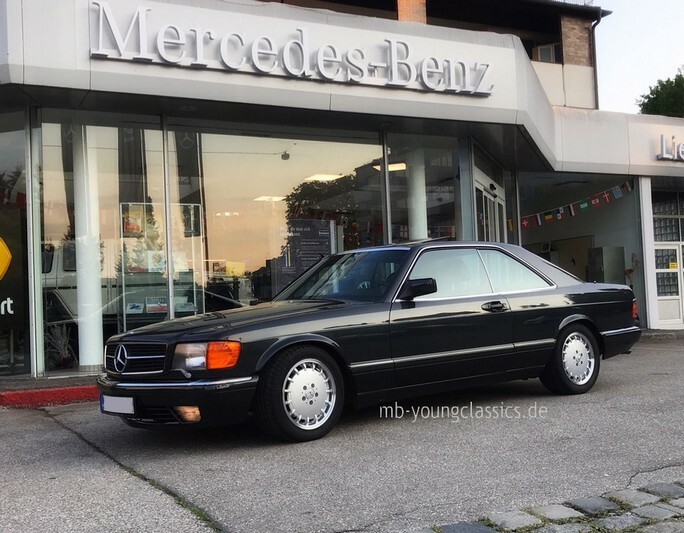 By the way, mb-youngclassics generally writes the word service very big – thanks to more than 30 years of experience in the field of Mercedes tuning, our customers can expect good advice in the choice of rims for every classic car of the 70s – 90s! No matter whether the customer wants restored original rims or new classics, mb-youngclassics advises on all questions that may surface”. This sizes are built from the same casting mould, which for the first time can be mounted without wheel spacers on the W126 and R107. These rims can also be made in silver or with shiny lathed lips. Entry facilitated by individual acceptance. Also available for W126 and R107 (incl. additional package with track plates from SCC). 9×17 ET 0 These rims have a wider rim base at the rear and emphasise the sporty character of this rim combination. All rims are supplied with matching screws, hub caps and valves. More information at www.mb-youngclassics.de.